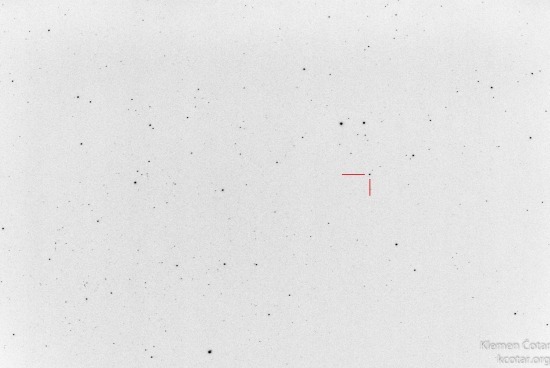 Another fairly bright Nova was discovered on 29. March 2015 when it was shinning at the unfiltered magnitude of +12.2. Nova Ophiuchus 2015 at estimated magnitude of +11.4, 20. April 2015 02:55 UT. Nova’s position is indicated with the red cross in the image. Nova Ophiuchus 2015 in colors. It’s orange/reddish color is clearly noticeable. Picture taken at the beginning of the nautical twilight thus the skies are brighter and bluer. This is the brightest nova (that can be observed form mid-northern latitudes) in 2 years after Nova Delphini in August 2013. Nova was discovered on 15. of March, when its brightness was estimated to magnitude +6.0. After few days its magnitude peaked to about +4.4 and was easily observed by naked eye. The best time to observer this new bright star is just before the start of astronomical twilight, when the nova is at its highest position in a dark sky. As the name may suggest, novae are not really new stars but an explosion on a star that was barely observable before the event. They occur in binary star systems where tiny white dwarf (but with very strong gravitational force at its surface) pulls gases from a close nearby companion star. With time accumulated material forms a thin layer on the hot surface of the white dwarf star. Gravity at the surface compacts and heats the material until it fuses and burns explosively to create the explosion called a nova. 4 – Full moon at 12 UT. 4 – Conjunction of planets Mercury and Uranus At 11UT they are separated ~0.5 degrees. 5 – Uranus at solar conjunction, not observable. 6 – Comet C/2012 F3 (PANSTARRS) at perihelion, not very bright, it may reach magnitude +13. 19 – Mercury at superior solar conjunction at ~03UT. 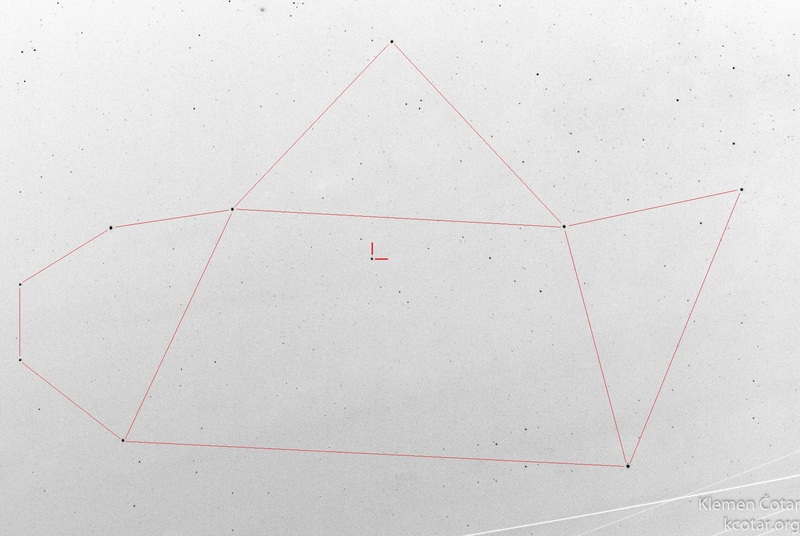 22 – The Lyrid meteors peak at 24:00 UT with a ZHR of 18. 22 – Moon passes 0.1 degrees North of asteroid Juno. Sn 2015f or PSN J07361576-6930230 Supernovae in NGC 2442 . Nova Sagittarii 2015 No. 2 or PNV J18365700-2855420 Nova in constellation Sagittarius. 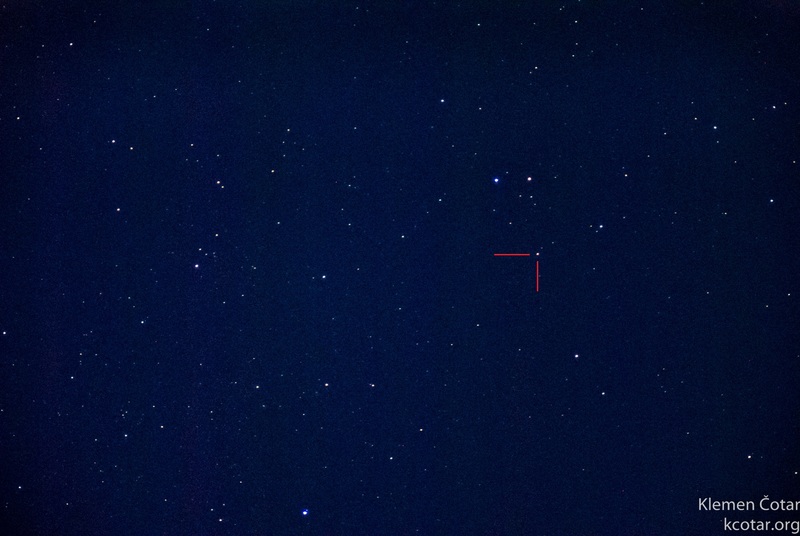 Nova Oph 2015 or PNV J17291350-1846120 Nova in constellation Ophicious.